Two long-serving Hucknall councillors are fighting back after claiming they were ‘dumped’ by the Labour Party for the forthcoming Ashfield District Council elections. Couns John Wilmott and Trevor Locke, both de-selected by Labour despite having served on the council for a combined total of 40 years, have resigned from the party and set up a new group called Hucknall First Community Forum. 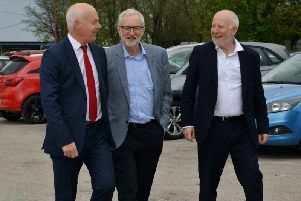 They will stand in the elections under this label, or as Independents, and launched the forum at Under One Roof on Hucknall’s Vine Terrace last Friday. Coun Wilmott, who is also a Labour member of Notts County Council, said: “Our resignations from the party has been made with deep regret. It is a big decision but we feel it is a very necessary one. “This is not the Labour Party we were brought up in. Some decisions made by Hucknall Labour Party branch and group, the East Midlands Regional Labour Party and HQ have left us numb and totally devastated. Coun Wilmott has served on the council for 25 years and is a former chairman, while Coun Locke has been a member for 15 years. Coun Locke said: “John and I have been loyal to the Labour Party all our lives and we feel heartbroken at having to make this decision. Coun Wilmott claimed that over the last four years there had been regular ‘fall-outs’ among Ashfield Labour members, with some verbally attacking each other and the executive being undermined. He told the meeting that the forum would work with local groups, including tenants and residents associations, churches and charities. “The group will set priorities for the town which must be considered by the council,” he added. At the meeting, Couns Wilmott and Locke wore the forum’s silver rosette which has a picture of people at its centre.